When it comes to making music, there are really only a few ways to create the tones needed — pluck something, blow into something, or hit something. But where does that leave this dry-ice powered organ that recreates tunes with wind chimes and blocks of solid CO2? It turns out this is firmly in the “hit something” camp, as [Leah Edwards] explains of her project. When the metal wind chime tubes come in contact with dry ice, the temperature difference sublimates the solid CO2. The puff of gas lifts the tube slightly, letting it fall back against the brick of dry ice and making a tone. The process is repeated rapidly, providing a vibrato effect while the tube is down. [Leah] used solenoids to lift the tubes and, having recently completed a stint at National Instruments, a bunch of NI gear to control them. The videos below show a few popular tunes and a little bit about the organ build. But what — no songs from Frozen? Tired of hearing that flat sounding wireless doorbell when visitors happen to come by? 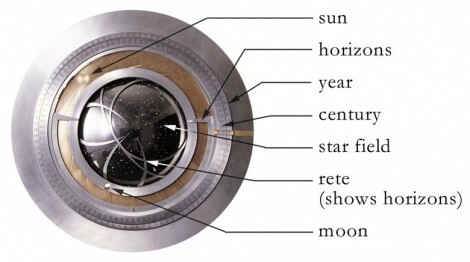 Don’t get rid of it, improve it by adding a real bell. This hack rigs up a small hand bell to the wireless doorbell receiver. 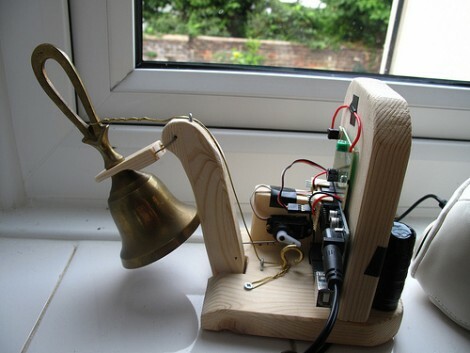 It was prototyped using LEGO pieces to shake the sound out of the bell, but the finished version uses a servo motor on a wooden frame. An Arduino monitors the wireless receiver, driving the servo when a transmission from the front door button is received. Traditionally door bells have actually been chimes that are struck with solenoids. 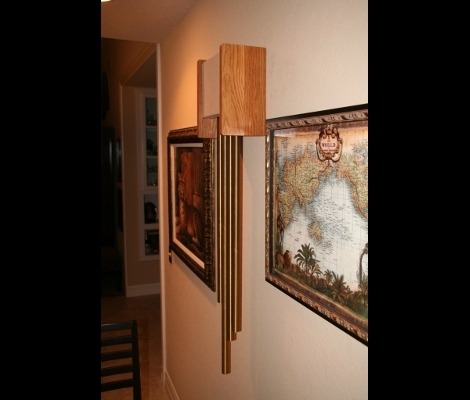 We appreciate this rendition because it adds an element of kinetic art to the home, laying bare the functional hardware instead of hiding it in a box. Don’t miss the demonstration after the break. [Dan Kouba’s] parents replaced their doorbell button with one that lights up and found that the chime wouldn’t stop sounding after the button was pushed. These lighted buttons use an incandescent bulb in parallel with the button (a piece of hardware we’ve hacked in the past). It draws a small amount of current which isn’t enough to trigger the chime, but it is just enough that the chime unit reacts as if the button press never stopped. His parents asked what he could do about this and after some investigation he build a replacement board for the chime unit based around an ATtiny26L. The board monitors the voltage drop across a resistor in the doorbell circuit. When the comparator on the AVR detects a rise in the voltage drop across the resistor it rings the chimes, actuating the solenoids with a set of PNP transistors. [Dan] sent us all of the details which you can check out after the break.